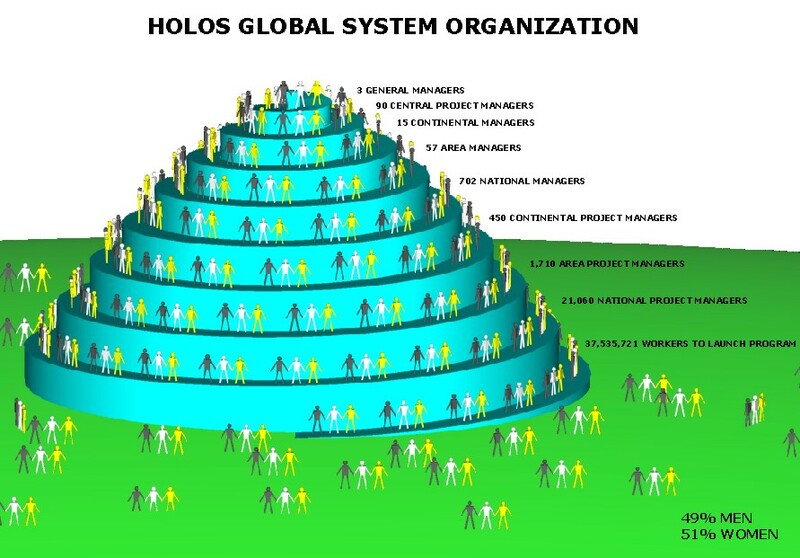 Holos Global System is a program of concrete initiatives to face, on the entire world, the most felt and urgent problems of humanity and to change the hierarchical structure of the human system in a conarchical one. Putting into effect the Holos Global System requires ideas, resources and organization. The ideas are concrete solutions to material problems and the way its original causes can be removed. The monetary resources made available to carry out the program amount to about 13,200 billion PPA (Purchase Power Parity) US Dollars. As well as enterprise capitals for a nominal value par to 525 million tons of platinum. The structure necessary in order to promote the program provides the participation of more than 47 million people organized according to zone and tasks, in groups of three, to assure interaction and cause the maximum dynamic attraction. Following a human ethology principle, every better situation rises by a self-compulsion. Therefore, despite the resources made available to the program it’s absolutely necessary that each one will accept to suffer a certain cost to carry it out. In fact, joy – which isn’t «pleasure» nor «happiness» - rises from the suffering of a related «sorrow». The case of what the climber feels by reaching the top – and that he wouldn’t feel if a helicopter had taken him there - is a pragmatic example of this principle. Therefore, it’s necessary that every promoter of the program is in the condition to produce and produces the resources to face his own requirements, and also that each participant suffers a minimum cost. This website is the instrument to form the structure of the Holos Global System. Who wants to take part to the program can choose a task according to his own knowledge, abilities and attitudes. Until the program won’t be carried out completely, the participants will be acknowledged remuneration based on three levels: tasks, responsibility and performance.